Kakougan Ryu Karate Club is a small club originally formed nearly 20 years ago based in Carbis Bay (St Ives) and Penzance, West Cornwall. The club is led by Rob Jones 4th Dan with Christine Shaw 3rd Dan and Simon Norris 3rd Dan as key instructors who between them over 60 years of karate and martial arts experience. The style of martial arts taught is contemporary. 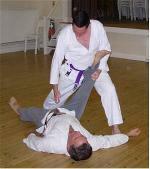 Traditional Japanese Wado-ryu and Shotokan techniques are worked with modern sports and self-defence techniques. Whilst we are not a formal club we teach to a high technical standard. We believe strong technical basics are necessary as foundations for the lighter faster style required for sparring purposes. Thus we teach a set of Pinan Katas (a series of pre-set techniques against imaginary multiple opponents) which reflect a light athletic contemporary style. In addition we teach some of the Shotokan katas to help develop the strong essential stances and techniques of that style. In recent years largely due to demand we have taught a wide range of practical self defence techniques against single and multiple opponents. 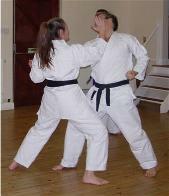 Effective strikes, sweeps and take downs are regularly practised. In addition to the basic and freefighting techniques we also teach the less well known stances such as Sanchin dachi (hourglass) kiba dachi (horse stance) and kokutsu dachi (back stance). Each stance has it’s own distinct purpose and applications. 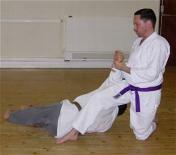 Furthermore we can offer Okinawan weapons training for the more experienced students. Katas and Bunkai (applications) and ippons (blocks and counters) are taught in The Sai (3 prong trunchion) and the Bo (Long staff). Weapons training is an interesting addition to karate (empty hand) and helps broaden our martial arts knowledge. All techniques are taught in the Japanese language as this enables clear and precise instruction. Our aim is for students to enjoy improved fitness, flexibility and self-confidence through training in an informal and welcoming environment. 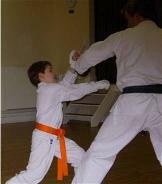 We welcome students of any age and level of fitness. Examinations for belts are done as and when students reach the desired standard. New students receive a detailed grade by grade syllabus (albeit in Japanese) outlining the basic requirement at each level. Typically lower grades are examined every 6 months. Higher grades annually. This of course depends on the amount of training undertaken by individual students. Whilst some martial arts clubs are moving to heavy and full contact we have found that such levels of contact acts as a disincentive to study karate. Many of the techniques cannot (safely) be used with full force other than on kick/punch bags, break boards etc. We work hard to enable students to develop the skills control and techniques to enable light contact only. This is very much in keeping with the original karate traditions. In any event fist/kick pads are used when required.